Fresh Crisp Salad you are sure to enjoy this fall season. 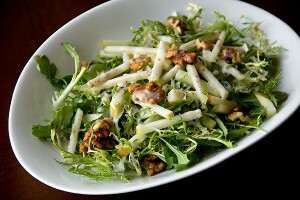 -In a large bowl, add the frisee, arugula, walnuts and about half of the matchstick-sliced apples, and drizzle lightly with some of the Spiced Cider Vinaigrette; add equal portions of the salad to bowls or plates, and then top each salad with equal portions of the remaining matchstick-sliced apples and another generous drizzle of the vinaigrette; serve as is, or garnish with a few additional candied walnuts. -Add all ingredients through the curry powder into the bowl of a food processor, and process until everything is well combined and smooth; with the processor running, slowly drizzle in the oil and continue to process until the vinaigrette is well emulsified and blended.